Flushing & Mylor’s mens crew in this weekend’s Helford River Race battled a broken stretcher and duelled with a powerful Dutch crew in the long drag from the mouth of Helford River up to Gweek boatyard. 16 gigs as well as numerous other craft such as flashboats, skiffs and tenders took part. Our crew was made up mostly from the ever improving Mens-B crew and hung in despite breaking the #5 stretcher off the start line. The draining pursuit race meant they had one boat to keep ahead of (the Dutch Mens-A crew) and 14 others to try to get past in order to win. There’s a prize for 1st over the line and another for fastest boat over the course. First boat in was Helford’s World Champions Ladies Vets in Golden Gear. 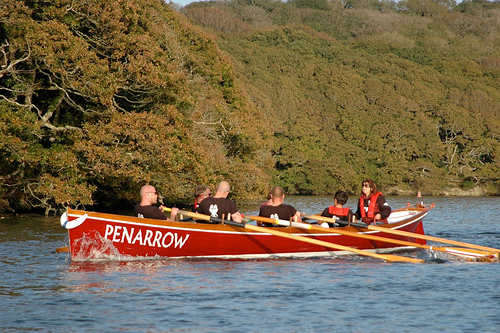 And the fastest boat over the course was…the Dutch crew in Helford by 1 second from our guys in Penarrow, after over 33 minutes of racing. So close and not the first time these guys have been denied by a matter of a second or two. It’s only a matter of keeping the hard work going and improving all the time – there’s loads of talent and exciting potential right across the club and here’s looking forward to success in 2010.